downtown Aspen. It opens during the AAM’s 35th year of presenting internationally important contemporary art, with a dynamic slate of exhibitions in six gallery spaces throughout the four-level building. The 24-hour public grand opening on August 9 follows the Museum’s 10th annual ArtCrush summer benefit on August 1, and a members’ opening on August 2. Sculpture Garden] is developing a new project for the AAM’s sculpture garden. height of fourteen feet, most infused with natural light. mobile pedestals where art will be exhibited. the new AAM’s lower level, three galleries, art storage, and art preparation spaces. Ban (Shigeru Ban Architects) for the project. completion established for summer 2014.
for the Museum’s endowment, and $38 million toward the building project. The new facil­ity will be located at the cor­ner of South Spring Street and Hyman Avenue in down­town Aspen. In 1979 the Aspen Art Museum opened its doors at the ren­o­vated Holy Cross Power Plant on the banks of the Roaring Fork River. For 33 years that facil­ity has served the mis­sion of the orga­ni­za­tion well, fos­ter­ing a pro­gram of art, dia­logue, and cre­ativ­ity that has grown into a major cul­tural insti­tu­tion serv­ing Aspen, the Roaring Fork Valley, the region, and the world. The mete­oric growth of the museum in recent years has seen a 200% increase in bud­get, num­ber of stu­dents served, and annual vis­i­tors. A long-standing strate­gic goal for the AAM—the expan­sion of its facil­ity and relo­ca­tion to the down­town Aspen core—has become a neces­si­tated real­ity to meet the ongo­ing demand for ser­vices to the community. With the unan­i­mous sup­port of the AAM Board of Trustees, the ini­tial fundrais­ing suc­cess, the iden­ti­fi­ca­tion of Shigeru Ban as design archi­tect, and the August 2011 acqui­si­tion of prop­erty at the cor­ner of Spring Street and Hyman Avenue in Aspen, the AAM com­menced con­struc­tion in fall 2012 of a build­ing appro­pri­ate for the pro­duc­tion, pre­sen­ta­tion, and expe­ri­ence of art. 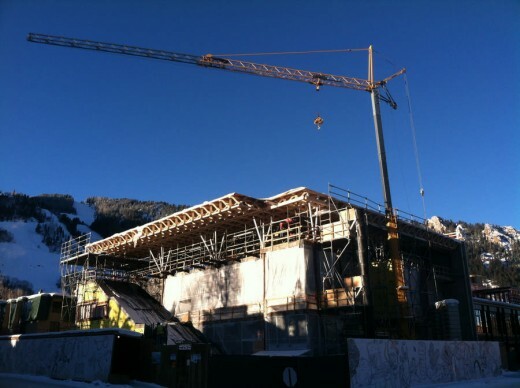 The New Aspen Art Museum is 100% pri­vately funded, and under the lead­er­ship of the AAM New Building Committee, will be com­pleted within bud­get and on time for the sum­mer of 2014. SBA com­prises 55 mem­bers work­ing in three offices (New York, Paris, and Tokyo) and has com­pleted sev­eral museum projects abroad, notably the Centre Pompidou-Metz (2010). 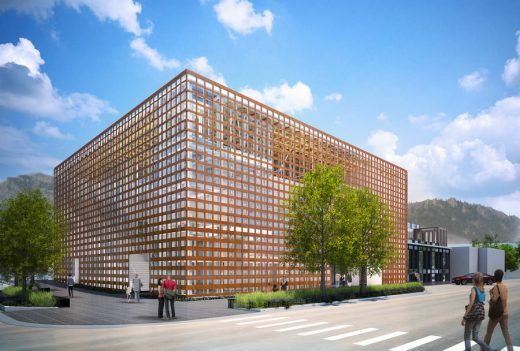 The New Aspen Art Museum will be the renowned firm’s first per­ma­nent US museum to be con­structed. Click here to read more about New AAM archi­tect Shigeru Ban. The AAM’s local archi­tect of record, Basalt, Colorado–based firm CCY has been rec­og­nized with over 100 design awards, includ­ing the AIA’s Architectural Firm of the Year for the Western Mountain Region, and has been fea­tured in over 50 pub­li­ca­tions, includ­ing Architectural Digest, Architectural Record, Robb Report, Western Interiors and Design, Town & Country, Urban Land, and USA Today. An inter­na­tional leader in build­ing ser­vices, Turner Construction Company’s broad port­fo­lio includes sig­nif­i­cant expe­ri­ence in museum and cul­tural projects. A select list of its recent projects includes the Art Institute of Chicago’s Modern Wing and Nicholas Bridgeway; the future home of the Whitney Museum of American Art in New York’s Meatpacking District; and 2002–6 ren­o­va­tion and expan­sion of The Museum of Modern Art. A full-service con­struc­tion man­age­ment firm based in Basalt, Colorado, Summit Construction Company is rooted in the core prin­ci­ple of pro­vid­ing excep­tional cus­tomer ser­vice. Summit begins each job with metic­u­lous orga­ni­za­tion and the for­mu­la­tion of a com­pre­hen­sive plan, and prides itself on effec­tive com­mu­ni­ca­tion of the project and its goals to both the con­struc­tion team and the com­mu­nity at large. Summit’s recent projects include the Westin Hotel in Snowmass Village. Michael O’Connor brings over 25 years of con­struc­tion and devel­op­ment expe­ri­ence to the build­ing project team. In addi­tion to his work with the AAM, he has been act­ing as a devel­op­ment and con­struc­tion con­sul­tant to the Aspen School District and the Town of Snowmass Village, Colorado. Based in Basalt, Colorado, he has also worked with the Aspen Skiing Company as an owner rep­re­sen­ta­tive on sev­eral con­struc­tion and plan­ning projects and has part­nered on the con­sult­ing ven­ture Resort Opportunities and Investments, LLC.